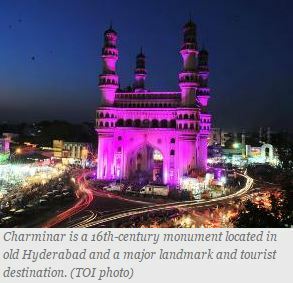 HYDERABAD: Telangana deputy chief minister Mahmood Ali has kicked up a controversy with his remark that the historic 'Charminar' will be razed if it becomes dilapidated while defending his government's decision to rebuild the 90-year-old Osmania General Hospital (OGH) here. Opposition has been against the move to reconstruct OGH, saying they will not allow demolition of the heritage structure. "We will make 10-15 storey hospital...and it will be able to cater 10 times the number of patients it does now. It will have the same name (OGH) ... When a building becomes weak, if Charminar becomes weak, in 200 years, 400 years or 500 years, it will have to be razed too. If a building becomes weak, it can fall any time and claim many lives," Ali said on Saturday. Clarifying his remarks, the deputy chief minister on Sunday said that he only made a general reference to 'Charminar' to present his argument for rebuilding OGH which is in a dilapidated condition. Charminar is a 16th-century monument located in old Hyderabad and a major landmark and tourist destination. "Charminar is our 'pehchan' (identity). We will strive to strengthen it. I was speaking in a general sense that after 1,000 years (we have to think about it)," he said today, when asked about the controversy. Noting that mostly poor patients come to the OGH for treatment, he said the government wanted to act in the best interests of the people and accused the opposition of doing politics over the issue. The government wanted to expand the capacity of the hospital to treat more number of patients, he said. Highlighting that the OGH is a heritage structure, the main opposition Congress, MIM and other parties, however, opposed its demolition. Telangana Congress working president Mallu Bhatti Vikramarka, Rajya Sabha member V Hanumantha Rao and other party leaders, who visited the OGH on Saturday, said the hospital was built by the then Nizam rulers for the benefit of poor patients. Observing that they would resist attempts to demolish the structure, Vikramarka said the previous Congress government (in undivided AP) had given Rs 100 crore for modernizing the hospital. There is 10 acres of land beside the hospital and the government can raise buildings there, he said.